Imagine yourself standing on the beach. It’s the first time you’re about to scuba dive. Your instructor is standing behind you. You’ve been going through, and many times at that, all security routines and potential hazards. You’re feeling safe and comfortable. But now, something is happening. A frown on his forehead, a strange feeling in your arm, an unexpected sound from the oxygen tube. You get dead scared and begin to regret the entire project. Your thoughts keep spinning. What will happen down there, under the calm surface? Is it true that there are no sharks? What if you swim into an underwater cave and don’t succeed in getting out again? Finally, you hear yourself yelling: “I DON’T WANT TO! No scuba diving!” And the instructor responds, with all the clam and assurance he can muster: “Well now, everything’s gonna be just fine”. In 1970, the psychoanalyst Marjorie McDonald wrote a paper called “Transitional Tunes and Musical Development” (Psychoanalytic Study of the Child, 25:503-520). She noted that the word “lullabye”, that is, the tunes we sing to our kids when tucking them to sleep, has the same root as the word for separation; “goodbye”. Her observation put me on the track to linking falling asleep with the fear of separation. Various methods exist, such as the “five-minute-method”. 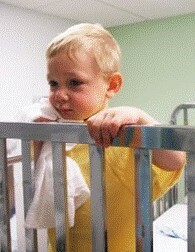 The baby lies awake in the nursery, and every five minutes the parent enters merely to show that s/he is still there. One should be close to the child but minimize body contact, and be supportive and encouraging. The idea is to show the child that falling asleep is not dangerous and the child has not been abandoned. I hear many parents criticizing this method, because they feel it is harsh and automatic and when instituting it with their child causes them great pain. Certainly, if they read about it like a cook-book recipe, that might be the consequence. To me, it is more important to try to imagine what goes on in the child’s mind, and to explain it to the child: that it’s night time, one can feel scared or lonely, but there’s a tomorrow as well, and then one will meet Mum and Dad again. The idea is not so different from the five-minute-method, except for one ingredient: talking to the child about his/her emotions. Certainly, it must be applied lovingly and what Dolto called in order to be “symboligenic”. That is, the adult’s words convey to the baby – though he of course does not understand them literally – that the parents are thinking about him, trying to understand him, and thence the child can create some internal images like “Mum’s good” or “Dad’s safe”. The prerequisite is that the parent is not in the throes of his/her own separation panic. Actually, this condition needs to be fulfilled no matter which “method” you choose when tucking your child to sleep. One has to rely on one’s intuition about what the child might experiene right now – and also on one’s introspection. 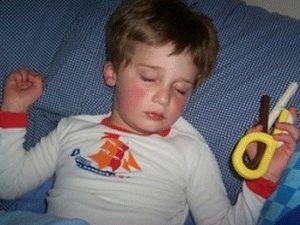 One might pose oneself a question: “Why has falling asleep become such an issue for Charlie – and for us?” The little boy on the picture found his own method of dealing with the night-time monsters: armed with some weapon-like objects he he is fast asleep. Good night, Charlie. Tomorrow is another day.